Ah, the beauty of makeup brushes. If you’ve been experimenting with makeup for a while, you’ve likely come to realize how important a good makeup brush really is. Whether you’re an aspiring makeup artist, or just love to do your makeup on a daily basis, the right brushes are key to getting the look you want. Maybe you want a way to apply foundation seamlessly to your face without your fingertips? Or you need to cover up an imperfection with a small, tapered tip? Do you want to apply the perfect smokey eye? How about create a soft contour on your cheekbones? Or highlight different areas of your face? Don’t worry, there’s a brush for that. For most of my makeup-applying life I’ve used only a handful of the brushes available. A brow brush, blush brush, powder brush, and shadow brush have been my tools of choice. But as I’ve been experimenting more with makeup – watching tutorials, learning from friends, and blowing my pay cheques at Sephora – I’ve come to realize that the makeup brushes are just as essential as the makeup itself. And all my research and experimentation has me wondering what I’ve been doing without the rest of these brushes all my life. You see, applying makeup with the right brush can be the difference between an almost-flawless face and an impeccably faultless complexion. The right brush will provide you with whatever you need, whether it’s a sweep of bronzer to add a natural glow to your cheeks or a soft smudge that blends your eyeshadow to perfection. From contouring and highlighting, to pressing for flawless coverage, these are the 12 makeup brushes every girl needs in their makeup bag. There are multiple uses for a large powdered brush (our favorite is the Sigma Beauty F20 Large Power brush), the most popular being of course, powdering the face. Dip it in your face powder and press all over your face for a matte, finished complexion. The brush also works well for contouring and controlled bronzer application. A round kabuki brush (we swear by the Sigma Beauty Round Kabuki F82Tm brush) can be used to apply a powder or cream foundation, and can be used for perfect bronzer application. With cream and powder products, use a circular motion to blend for flawless coverage. With bronzer, sweep the brush along your cheekbones, temples, hairline, and your jawline in the shape of a “3”. Created specifically for the application of liquid and cream products, a flat kabuki brush allows you to blend these products flawlessly into your skin. We love love love the Sigma Beauty F80 brush! Use it on the flat areas of your face such as your cheeks and forehead for seamless coverage. The compact and dense bristles make foundation application a breeze and the synthetic fibers are easily cleaned. If you’re not a fan of pencil or liquid eyeliner, turn to a flat definer brush like the Sigma Beauty E15brush for your liner needs. Use the brush with powder, cream, or gel shadow along the lower lash line for the desired effect. The thin, flat edge results in a sharp, precise line that will give you a soft liner look. For the smooth application of powder products such as blush and bronzer, invest in a solid large angled contour brush (the Sigma Beauty F40 is a great pick!). Use the angle to softly contour your cheekbones. The fluffy, round edges result in a diffused contour that will look au natural. A highlighter brush is essential for any gal who wants to add some natural sheen to her face. Dip the bristles in your favourite highlighting powder and use it on your cheekbones, forehead, nose, and inner corner of your eyes. The tapered brush head allows for smooth application and will give you a natural glow. Not sure which one to choose? We recommend the Sigma Beauty F35 brush. Hands down. When you’re applying an eye shadow base or a cream shadow, a large shader brush like the Sigma Beauty E60 brush will provide quick and even coverage. With slightly beveled edges, use this brush with cream, powder, or liquid products to uniformly cover the lid. A great eye shadow can look even better with the proper brush, and this one is the cream of the crop! A concealer brush (we swear by the Sigma Beauty F70 brush) is key to cover up those tough-to-reach places around your nose and eyes. This small and slightly tapered flat brush allows you to conceal pesky impurities that manifest in tiny areas around your face. Dip it into your concealer and pat it on your problem areas until it is flawlessly smudged in. Any makeup guru knows the importance of blending products, and the Sigma Beauty E25 brush helps you do just that. With a slightly firm, rounded brush head, it was created for the universal blending of products, softening intense lines, and blending eye shadow colours onto your lids. Everyone loves a good smokey eye, but when it comes to mastering that technique, the right brush is key. A soft-bristled smudge brush like the Sigma Beauty E21 brush allows you to score the perfect smokey eye with a softening effect. You can also use the tool to smudge out pencil liner with powder or cream products. For perfectly painted eyebrows, use an angled brow brush (we like the Sigma Beauty E75 brush) for easy application. Dip the angled head into brow powder and fill in your brows for a natural or bold look. Make sure to go for a brow brush that’s angled so you can tackle the thin ends of your brows. If hard line eyeliner isn’t your thing, use a beauty pencil brush like the Sigma Beauty E30 brush to create soft definition. Apply your pencil liner and gently smudge it with the pencil brush to create a soft, sultry look. You can also use the brush to smudge eyeshadow on your upper and lower lash line. There you have it. These are the 12 makeup brushes every girl needs in her life. Up your makeup game with these amazing brushes that will allow you to do more to your gorgeous face than ever before. 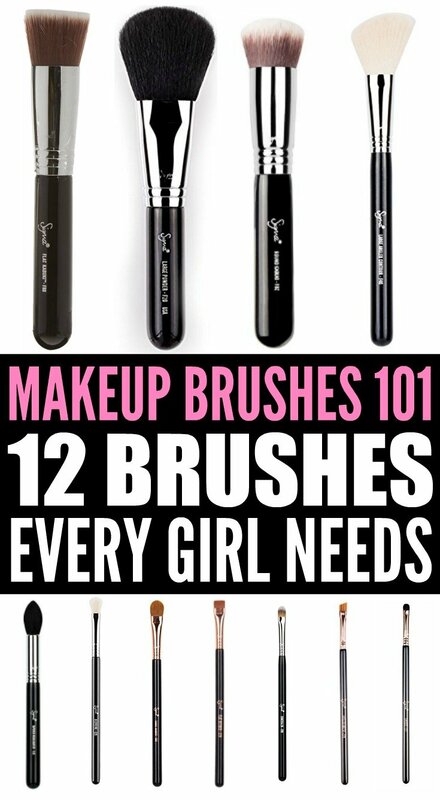 If you found this makeup brushes 101 cheat sheet helpful, please share it on Pinterest!